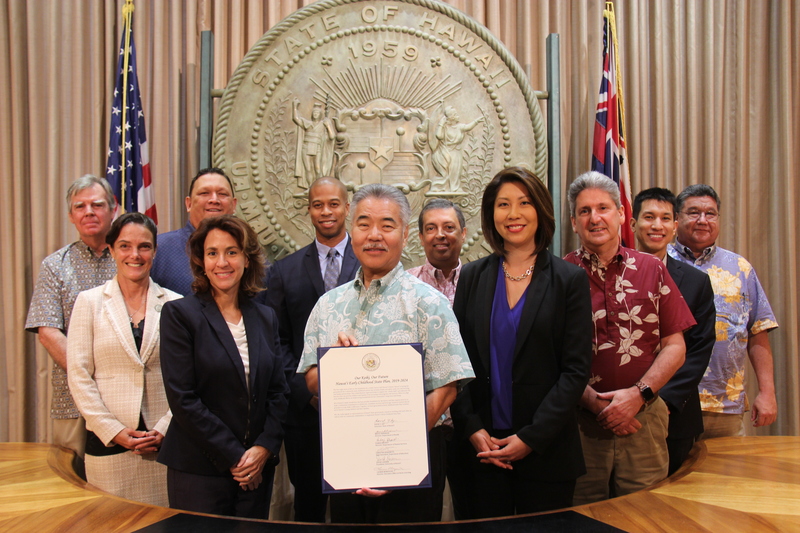 From Governor Ige’s policy perspective, a vision needs to be both ideal and real. What is our collective vision for Hawai‘i and how do we make it happen — in education, affordable housing and sustainability? 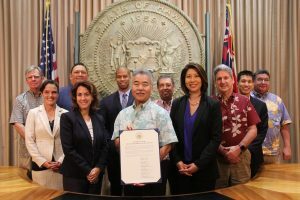 The governor outlined some of the answers in his State of the State address and the steps Hawai‘i can take to move us forward. This edition and future issues of Capitol Connection will describe some of these initiatives and how the state hopes to make them a reality. FOR THE KEIKI: Gov. Ige, state leaders and legislators at the signing ceremony for the Early Childhood State Plan. Q. In this second term of your administration, are you feeling a sense of urgency to move these initiatives forward? A. Yes, it’s about maintaining the momentum from the successes we’ve had in our first term and recommitting to these priorities for the future. One initiative that could make the greatest difference involves our first-ever Early Childhood State Plan, which sets the foundation for statewide efforts in health, family services and education. As a state, we’re implementing our coordinated ‘Ohana Nui approach to break the cycle of poverty and provide families with the support they need. A vital piece of this involves universal, statewide access to public and private preschools. Q. What led you to propose an expanded, statewide pre-kindergarten program in the public schools? A. We’ve had a good response to the 26 pre-K classes for 4-year-olds already offered in high-need communities. I thought it was important as a policy vision in the State of the State address to commit to a high quality, public pre-K program statewide because that’s the only way we can ensure everyone has access. We know making these investments early can change people’s lives and impact children long after their school years. Preschools on the neighbor islands are very sparse, and many in our community can’t afford the cost. Our long-term vision is to give every child in Hawai‘i a head start on learning and success in life by restructuring schools to pre-K through grade 5. Then grade 6 would become part of our middle schools, as they already are in some O‘ahu areas. Q. What are some of the first steps we can take in the short-term? A. The DOE has identified 22 classrooms in elementary schools statewide where there is demand and space available as a way to get started. Some middle schools have already changed to a 6,7 and 8th grade configuration. We’re focused on maximizing facilities in communities of highest need, especially in areas where they don’t have access even to private preschools. Q. What about questions raised as to cost, staffing or reconfiguration of some elementary schools? A. Obviously, it’s a big challenge. As we say in our Early Childhood State Plan, our long-term vision is that all 4-year-olds should have access to high-quality public and private pre-K programs. We’ve talked about what would be the most effective way to implement the program with existing extra classrooms. I’m confident as the Legislature looks at our budget requests that they will agree these areas are important and reflect the most pressing community needs. Q. What makes this month’s 50th anniversary of our state Capitol significant for you? A. I’ve always felt that our Capitol building was the most beautiful in the nation. Part of that is the architects’ commitment to capturing elements reflective of the islands as well as the open design. They wanted it to be “the people’s building” — inviting and accessible. I hope people can take time on March 15 or 16 to tour the building and take part in some of the activities. Read more in the March Capitol Connection newsletter. Subscribe to the Capitol Connection newsletter.